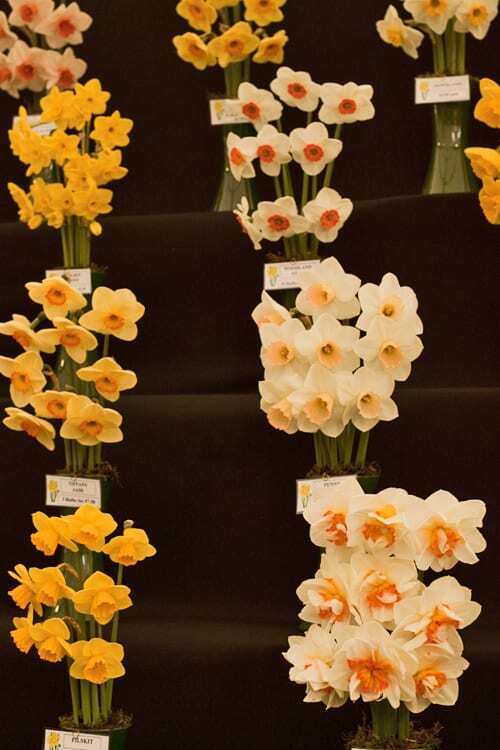 Last Friday, I visited the RHS Cardiff Show at Bute Park with garden designer, Lisa Cox and today’s blog post features my highlights from the show. 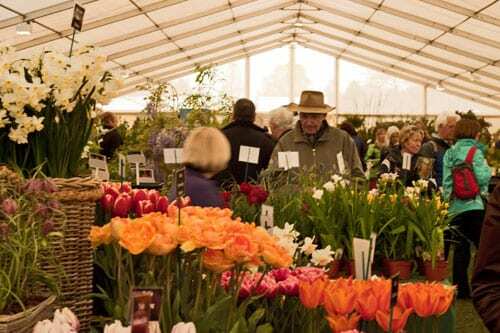 It’s the first RHS outdoor show of the year and it coincided with National Gardening Week. Firstly, here are a selection of the show gardens. ‘Best in Show’ was won by garden designer Harry Rich of Rich Landscapes who is new to the show. It was great to have the opportunity to meet him. 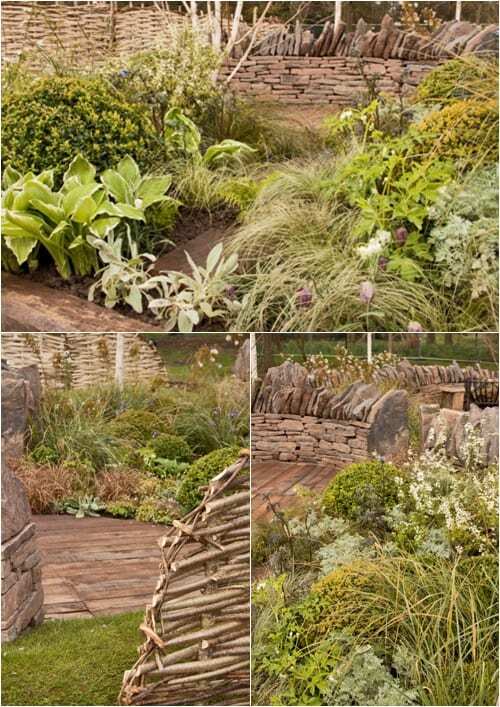 Capturing the essence of the Welsh countryside, his garden really shone out and it also won a silver-gilt medal. The white and purple flowering plants included Spirea ‘Arguta’, Snake’s head fritillary and Polemonium yezoense var. 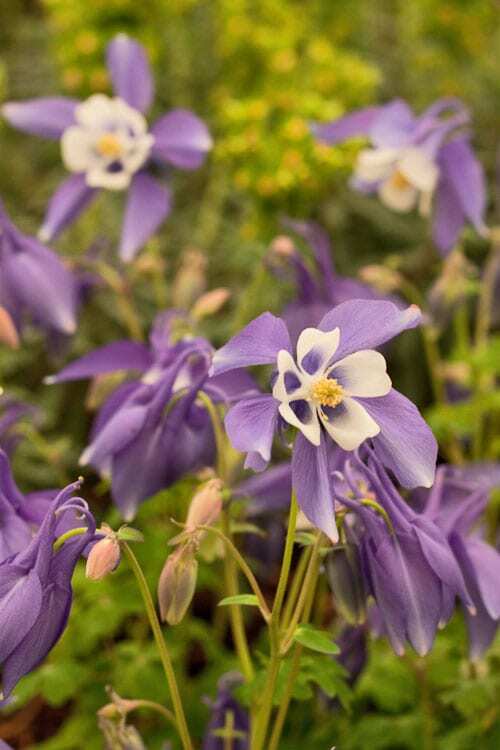 hidakanum ‘Bressingham Purple’. Designed by Gaynor Witchard is this contemporary urban garden below with low maintenance planting. 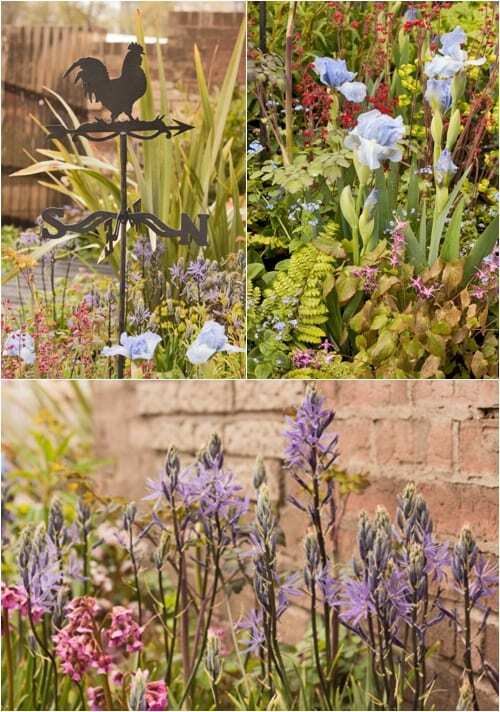 Many of the elements included in Gaynor’s design can be bought off the shelf from garden centres and retailers, hence the garden’s title. This garden by Broxton & Moruzzi has been designedby Jane Grehan of Dewin Designs to reuse waste materials generated by landscaping projects. And the inspiration was the shape of an unfurling fern frond as it comes to life in the spring. 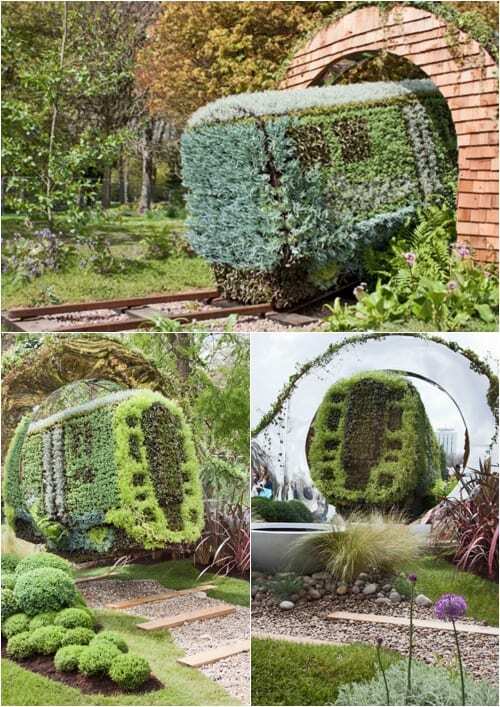 A quirky design which really caught my eye…a ‘train’ has been recreated using a range of succulents and low-growing plants. 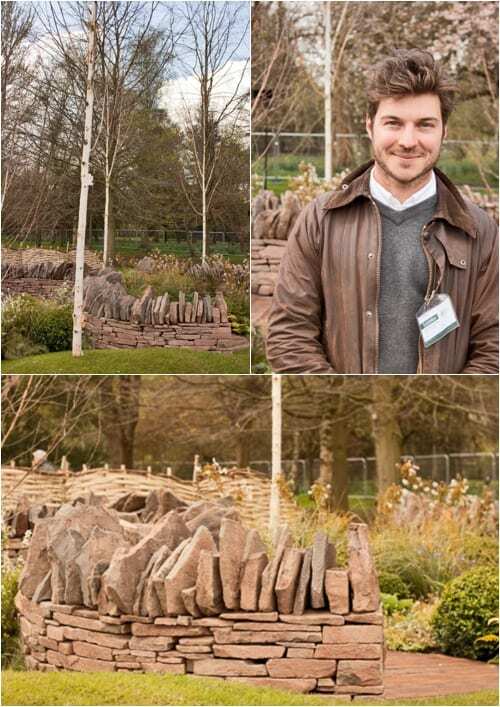 TV presenter and landscape designer, Chris Beardshaw, designed the garden below in consultation with community workers and landscape architects at environmental regeneration charity Groundwork and in collaboration with the RHS. 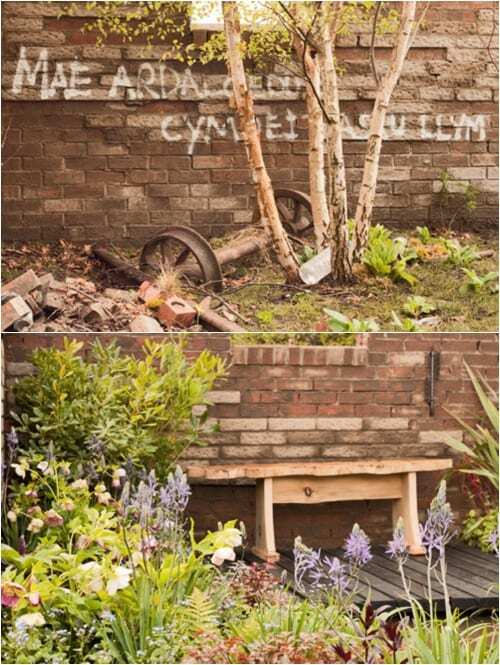 He has designed a series of show gardens themed under the title ‘Urban Oasis’ and they will showcase some of the most challenging urban environments where gardening, community work and good quality landscape design have brought people together and yielded powerful social benefits. 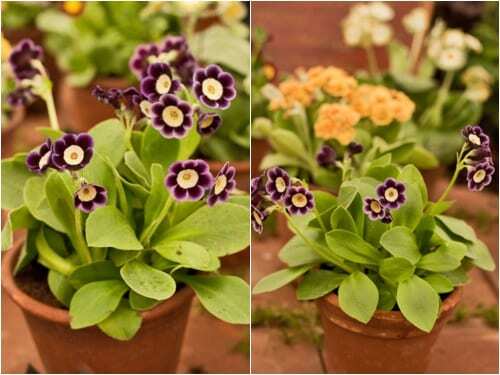 There were two sides to this garden at the Cardiff show, which won ‘Best Show Feature’, as you can see from the first image below. On the one side of the design there was a patch of derelict land and on the other side, the land was shown transformed into a beautiful garden. 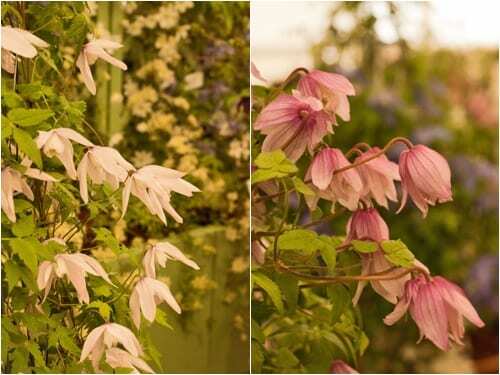 There were two floral marquees at the show with stunning displays…and they became very popular havens when the heavens opened! 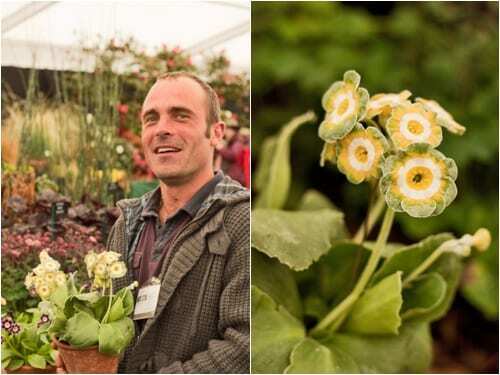 It was great to meet Simon Lockyer from W&S Lockyer and his beautiful auriculas, which are one of my favourite flowering plants. 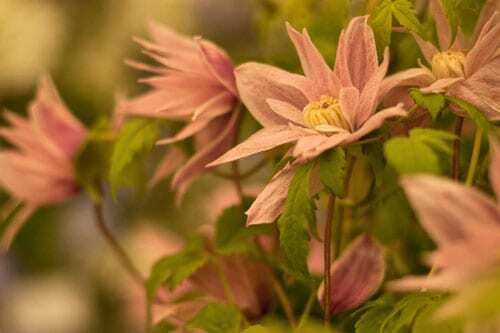 And the clematis on Priorswood Clematis‘s stand were absolutely stunning…I was entranced by the number of different varieties they had on display. 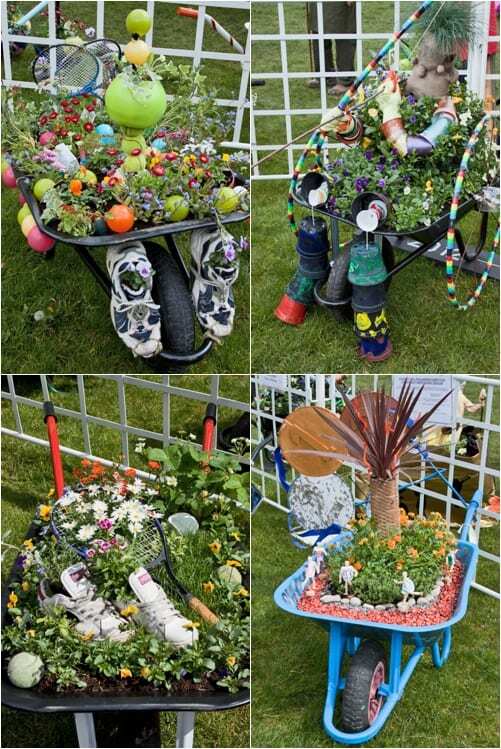 As featured on BBC Breakfast last Friday morning, here are a few fun photos from the very popular Schools Wheelbarrow Competition, which had the theme ‘Sports and Shoots’. 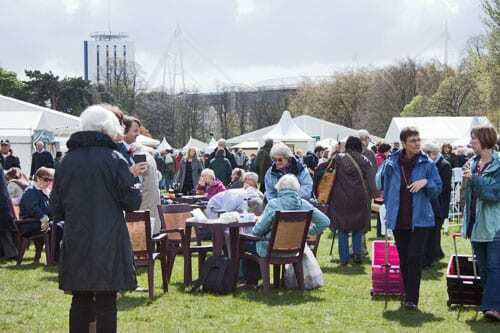 Situated near to the Millennium Stadium, the RHS Cardiff Show is only in its eighth year and although on a much smaller scale to the Chelsea and Hampton Court Palace shows, we had such a lovely day out. I’d never been to the event before and couldn’t quite get over how friendly everyone was. The showground’s size gives it an intimate, almost ‘village fair’ feel with a craft market and farmers market. I’d definitely recommend a visit if you’re in the area next spring.